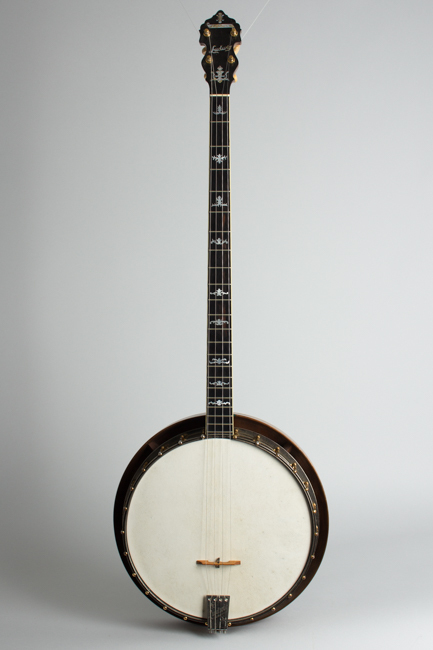 Ludwig Stratford Model Plectrum Banjo (1925), made in Chicago, serial # 4168, natural varnish finish, laminated walnut neck with ebony fingerboard, brass rim, original black hard shell case. This is beautiful example of Ludwig's mid-1920s craftsmanship, made at the height of the jazz banjo era. 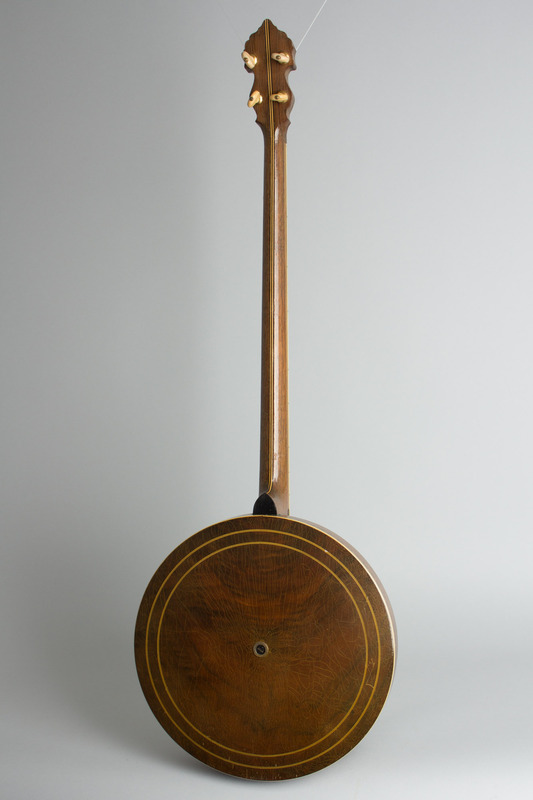 The Stratford Plectrum Banjo (and its tenor sister the Bellevue) occupied the middle of the Chicago company's banjo line, but is an extremely ornate banjo considering its original $150.00 price. 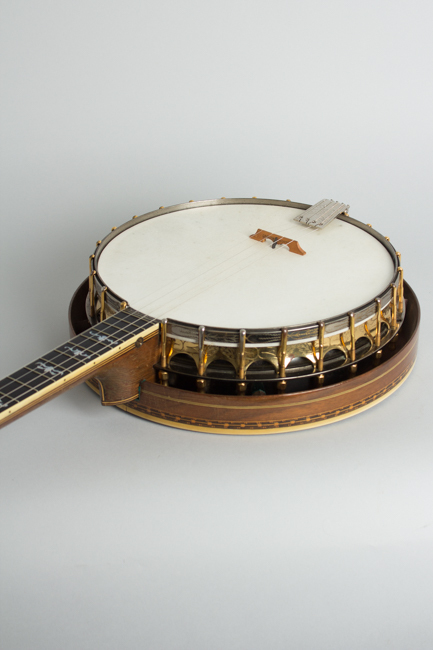 The engraved hardware is gold-plated over a gunmetal rim, an unusual tonal scheme specific to this banjo. As with all higher-quality Ludwigs, the neck and resonator are figured walnut, which Mr. Chas. McNeil (Ludwig's resident banjo designer/consultant) considered the "only" suitable wood. The neck is bound and features numerous maple and ebony laminates both horizontally and vertically, with very fancy shaped pearl inlay in the ebony fingerboard and an ebony veneered headstock with engraved inlay and script logo. The tuners are gold-plated Planet pegs, Ludwig's own invention. 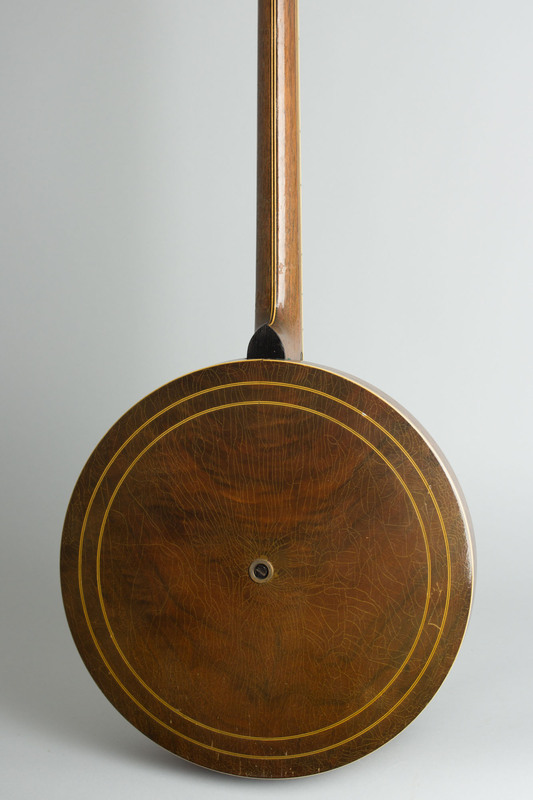 The resonator has a bound bottom edge with a marquetry strip at the bottom rim and decorative rings inlaid in the back. The hoop and rim are neatly engraved with floral designs, through the plating into brass. 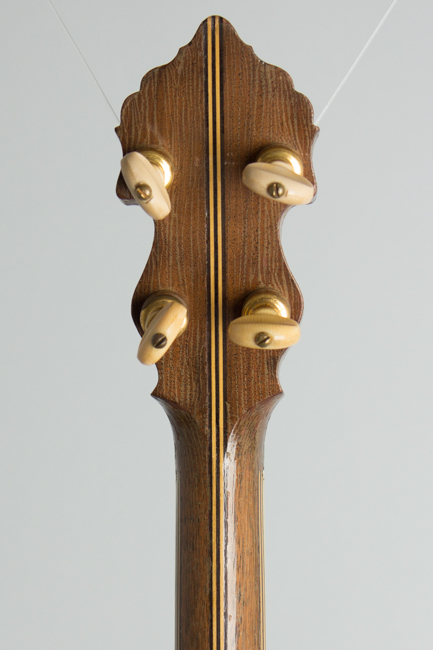 The instrument is fitted with the Ludwig banjo action adjustor, two screws at the base of the neck which still works perfectly. These early bottom-tension metal rim Ludwigs feature all brass rim parts (not pot metal) are very high-quality banjos, much rarer and better sounding than the later (post 1927) top-tension versions. In terms of dollar value at the time, Ludwig offered a lot of flash and sound for the money...and that is still true now! 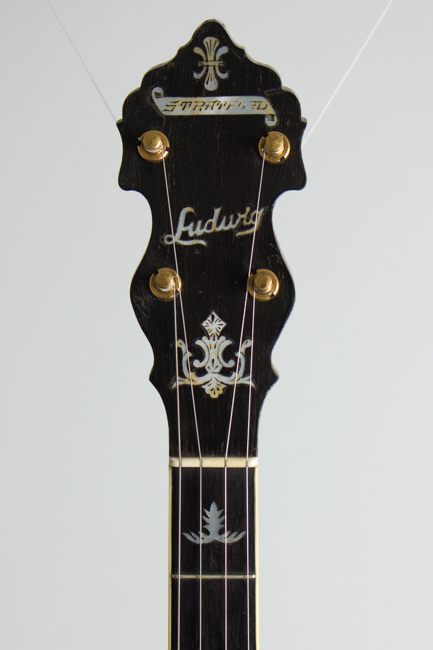 Plectrum Ludwigs are far from common, and this is a lovely and fairly rare example. Overall length is 37 in. (94 cm. ), 10 13/16 in. (27.5 cm.) diameter head, and 3 3/8 in. (8.6 cm.) in depth, measured at side of rim. Scale length is 27 in. (686 mm.). Width of nut is 1 3/16 in. (30 mm.). Extremely fine original condition; the only alteration is the original gunmetal finish Ludwig tailpiece has been replaced with a slightly older Ludwig-branded Kersher unit in nickel (the original is included but has some metal fatigue at the bend). The armrest is no longer present. There are a couple of very minor old cracks in headstock face veneer, and a few in the ebony fingerboard. Overall there is some typical finish checking and light plating loss. 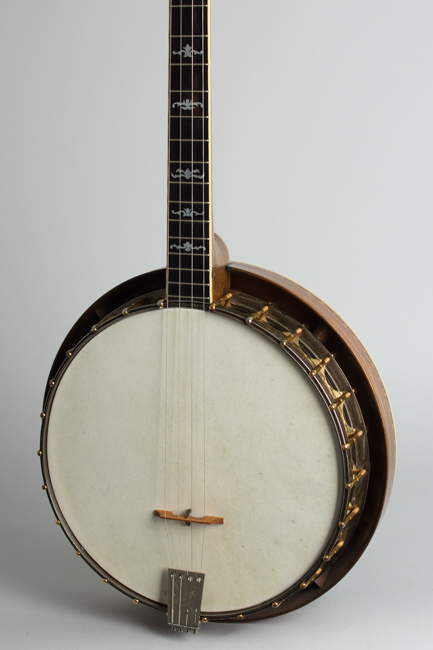 The banjo plays well and has a fine sound, warmer than expected for a metal-rim instrument (Ludwig banjos are not at their best when fitted with a modern plastic head, so a skin head offers a distinct tonal advantage here). The original Ludwig-badged, gold-lined, plush-lined case is also in good shape. Excellent Condition.